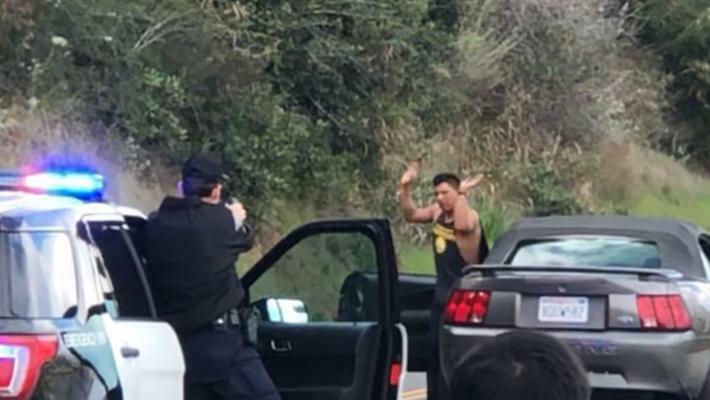 An alert detective using a mobile device to verify a hunch led a pack of Santa Barbara Police officers who caught a stolen vehicle suspect Monday morning. Police followed the vehicle until enough officers were behind the vehicle that had traveled from the Shoreline Park area to Loma Alta. That's where the stop was made. The driver was held at gunpoint until he was frisked, handcuffed and taken away. SBPD is on a Code 36 Frank. The vehicle is a Ford Mustang, they're getting ready to perform a felony stop East on Cliff Drive toward SBCC, Passing La Marina passing Oceano. Police are closing in. Westbound on Loma Alta still at the Red Light...3rd Unit where are you? Passing the school Rancheria down the lower side Attempt a Felony Stop Now. Didn't they change grand theft auto to a misdemeanor? If so, maybe that's why it continues to be a popular thrill. Flicka, I think they're "thinking" the same thing they do when they walk into traffic from between SUVs with their headphones on and their eyes glued to some device. Ignorance can be cured; stupidity can't. YACHT ROCKED, Since often it says, "keys left inside unlocked car" there is no way to prevent thieves from taking those ones. What are people who do that thinking ? Tagdes, is that a real statistic? If so, from where? Yes it is real, from various Google searches. St. Petersburg FL was highest at 83.4 % and Texas had 41% a year or so ago. I used those numbers as they are part of the 5 worst states of which we are one of. They are TX, CA, FL, MI and Ohio. The national average is albeit lower but we don't seem to be average at anything here. It might just be an observation but from the vehicle thefts I hear over the scanner I agree with it. Here it is, almost 2019, and car theft is still a thing. Why aren't cars hard to steal by now? We got GPS, OnStar, license plate readers, keys with chips in them, blah blah blah. And the others steal the 50 to 80% of vehicles with the keys left inside them. Some criminals are smart they learn how to by pass all that stuff. Did it have a gray painted license plate? I don't know I just saw some friends in their Mustang and I'm confused I did not hear the description of the car only that it was a Mustang. Roger over and out maybe slow traffic a bit but it will clear soon. Cancel code 33 One in Custody 500 Block of Loma Alta....All is well. Usually a Code 36 Frank vehicle is Hot.